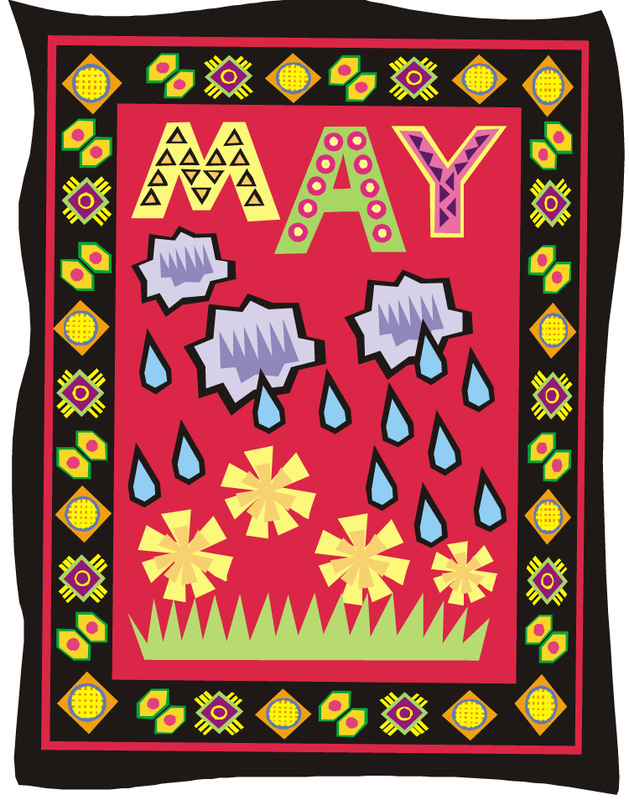 It seems to me that it was just the beginning of May, and here we are, tomorrow is June. Where does the time go? I had such good intentions of getting a lot done this month, but seem to have put off what I needed to do in lieu of doing what I wanted to do… again! It’s difficult to muster up the energy to work in garage trying to get things straightened out. My husband and I both know there are many things we simply have got to part with – hopefully not so we can make room for new things to put out there! Every once in a while we go through a “Let’s downsize.” phase, but we never actually do anything concrete about it. We have several boxes of our children’s most prized toys out in our garage, as well as boxes of different holiday knick knacks out there (or is it nick nacks?). At Easter time, I sifted through all of our decorations and was able to just about fill the second seat of our car with bags I quickly took to Goodwill. I knew if I didn’t act fast, I would start to get sentimental, and repack all of those Easter items, remembering special times in our past. As for the downsizing, every time we think we might be happier in a smaller house, we are reminded of how much we enjoy living in a house where we have the room for everything to be in its place. You know what I mean? If I need to mend a shirt, I know exactly where the thread and needles are. If I want to make a puzzle, I know right where our puzzles are kept. I guess it’s the familiarity of our house… our home. How about you? Are there any other procrastinators out there? You are talking to the world champion procrastinator, right here. And as sentimental as I am wide (which is considerable), size 26 actually so I am with you on at least two counts. It is murder(!) trying to get things done in this weather, even hard to breathe. Did you get my note that Earlene Fowler is apparently writing at least for the forseeable future? You could check her website to verify. I was sorry to see that. I enjoy the Benni Harper books. Marion, I decided it was finally time for me to read Earlene Fowler’s first Benni Harper mystery, and it appears that I am arriving late to the party! I know that a lot of people are going to be disappointed about the end of that series. Oh well, I guess with fifteen books in the series, I won’t be short of reading any time soon. Danna, what a special treat you will have in store for you by reading Earlene Fowler’s Benni Harper series. I have loved each and everyone of those books in that series. There are a few other series type writers who seem to be no longer writing books with my favorite characters, one is Martha Grimes Richard Jury series. Unless I just haven’t seen any new books from this series it seems to have been a while since a Richard Jury has been out. That might be a good topic for you to post sometime, that is some of us listing old favorite characters that seem to be no longer being written!!?? Linda C, this would be a really good idea for an entry topic. Thanks! I meant that Earlene Fowler is not writing, according to her website. Oh, by the way, you are correct, in that odds and ends is indeed spelled with silent ks. That is knick knacks. Nice to talk to you. Deb, I hear you!!! My husband gets rid of one of his “toys” just to replace it with two. This doesn’t have anything to do with this blog subject, but I really wanted to tell everyone about a story on tonight’s (5/31) CBS Evening News. It’s a wonderful piece about Cynthia Riggs in Steve Hartman’s ‘On The Road’ series. A friend (male) from her past (60 years ago) sends a coded ‘mystery’ letter to her. She figured out who it was from…………romance develops. GREAT story!!! As part of our continuing series “On The Road,” Steve Hartman meets 81-year-old Cynthia Riggs and 91-year-old Howard Attebery, a couple whose love story is a tale of romance and intrigue – and one more than 60 years in the making. I guess I could ‘tie it in’ w/subject and say I didn’t want to ‘procrastinate’ sending this to you (although in many things I am a huge procrastinator)!!! Thanks, MJ, I’m glad you didn’t procrastinate in sending us this comment! LOL Danna, Sooo many of us are in the same predicament! We have a big house and huge barn full of stuff. I’m a pretty good “pitch it!” type, but hubby is not. I mean, oil cans from 2001? Come on. Tuna cans full of old nuts, bolts and screws? Please. You see what I’m up against. Wish the American Pickers would drop by! Susan, oil cans from 2001?!? Yow!!! The American Pickers could do two shows on your husband! Laurel, you’re in good company! I love it. We were “lucky” enough to have a full reset 8 years ago when hurricane Katrina took most of our stuff. I remember thinking a year later when we finally had a new home that we’d never fill it with stuff. Of course I didn’t take into account all the gifts from my parents and others would replace kitchen gadgets and small appliances, etc. Now we’re nearly full and going through our things to see what we can send to Oklahoma. Pay it forward. I retired last year so that I could procrastinate! Too much to do and too much time to do it later. Kcathy2011, my husband took early retirement last year and I wish he had a “too much time to do it later.” attitude! When he gets it in his head that something has to be done, it has to be done immediately… The muggy weather is the only thing that is stopping him from clearing out the garage right now. Danna, I did see on the news last week that your city in Texas was experiencing heavy floods. I sure hope you and your family were spared. I feel so sorry for the people across this country who are having all the destructive weather storms and such. We here in my section of Ohio are having some heavy pop up storms and it is hot and very humid but nothing to what other parts of the country are having. To loose everything in a matter of a few minutes is beyond imagination to me. I have been having my own personal family problems but I know this problems will be taken care of eventually. I have a mantra that I have been saying for several years now. “This too shall pass!” Hopefully the people in the areas that are having all of this destruction will have their problems pass as well. Linda C, recently it seems like no parts of the country are safe from destructive weather. (I hope your family problems resolve quicker than “eventually”. I noticed you haven’t been here for a while and thought perhaps your yarn-work was taking up all of your time. Danna, i have been crocheting quite a bit. i still can’t do a ” granny Square” for nothing!! Aggravating!! But sometimes life just gets in the way. I have been reading more and more everyday. I am now reading the “Lumby ” series by Gail Fraser. This is a series about a small town in Washington, I believe and the quirky inhabitants of this town. I love a series like this, especially in the summer time. I don’t know why but in the summertime, I want to read more downhome tales about small town living. I can’t hardly describe it but my summertime reading just changes for some reason. Linda C, my crocheting is quite basic, since I do it to relax. Years ago, I would follow instruction books to make things, but now I just do the most basic crocheting possible. Danna, that is mainly what I am doing now with my crocheting. I have decided that right now I can’t get the hang of the some of more difficult crochet patterns so I am just doing the more basic patterns. I think I am getting better with these patterns and I like how my projects come out. Right now that is enough for me. plus, I am back to reading quite a bit too. Both projects, reading and crocheting are filling up my days so much that the days are just going by too, too, too fast!! Linda C, I’m glad to hear you’re back to your reading. Do you have the children full time during the summer? If so, I’m guessing they keep you pretty busy! Danna, I don’t have my grandchildren during the summer months. Their older sister takes care of them and another brother. I sure do those kids. I haven’t seen them for 3 weeks now. When my own two kids, and then my grandkids were growing up I was still working. Therefore I missed out on a lot of the things that little kids do. But with being retired and being able to babysit these two I have plenty of time to see what all they can get into. The kids are 5 and 3 and a half. They can really entertain themselves most of the time. Thus giving me time to crochet. I can do that and still watch the kids. My own kids were special, my grandkids were extra special. But my greatgrandchildren are such a very special gift. I have more time for this third set of kids. Linda C, I’m guessing you get pretty lonesome during the summer months. BUT it gives you a lot more time to crochet and read! This spring, I finally have built a “give away/sell” pile of stuff. Give away is relatively easy, but I’ve been having no luck at all on ebay, which everyone told me was the way to go. And actually I’ve been pricing things so much lower than they are worth. Anybody else been having that problem on ebay? Looks as if quite a few of you could use a visit from the guys on the TV show ” American Pickers.” Just don’t have the hubby there while they are doing their “picking! !” I don’t think ebay is all it is cracked up to be. It seems my excess “stuff” only get removed in the event of destruction. I live in my parents’ old house, and both attic and basement have been storage places for the things my siblings and I didn’t want to part with, things my parents didn’t want to part with, and things my aunts and my grandmother didn’t want to part with, for many decades now. A number of years back we had some heavy rains in December that flooded the basement, and in the ensuing clean-up I came across the dog’s bowl under the stairs. The dog, mind you, died about 3 years before I was born. Fortunately it seems no one was as sentimental about his kibble. Julia, finding your dog’s kibble must have been quite a shock, since you never even met the dog! Recently watched Season 1 of the Australian TV series based on Kerry Greenwood’s Phryne Fisher. It’s called Miss Fisher’s Murder Mysteries, and I really enjoyed it. They have approved a second season. They followed the books fairly well and the clothes were fantastic. I started on the garage this spring. I got…well, not quite half of it cleaned out. Of course, it was a necessity. It was getting difficult to get out of the car and climb over the toolbox with the groceries. danna, One thing about procrastinating and putting off any kind of household cleaning, That work will be waiting for you whenever you do decided to get it done. Linda C, hopefully this fall/autumn, when it’s cooler, I will finally go through some boxes out in the garage >>> or at least attempt to go through them. I have just finished reading book 7 of Maggie Barbieri’s books dictating the life and times of Alison Bergeron a Professor/Doctor at a Catholic College, and her gorgeous detective husband Crawford. Together with her friend Max and Crawford’s partner Fred, who coincidentally marries Max, Alison gets herself in deep water by her pure nosiness. These books are written with obvious love of the characters and upon reading the final word of book 7, I felt quite sad that I had to let all these wonderful characters go. What an author this lady is, they are funny, light and completely enthralling. Hope the next book is right around the corner. Danna, thanks for the info. I am sure whatever Maggie writes will be enthralling. I shall await its release.